The Franciscan Church on Lower Henry Street the foundation stone of the church was laid by Dr. Butler, Bishop of Limerick, in May 1876. 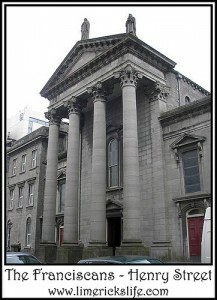 The present site on Henry Street was acquired in 1824, and a church was built in 1826 and a friary in 1827. The builders were McCarthy and Guerin and the architect was William Corbett. The church was completed in 1886. The Dominican Church has been renovated in two occasions: in 1928/30 when it was also extended and in 1968. Since June 2008 this church remains closed. The Franciscans were present in Ireland for about 700 years originally located an Abbey near Sir Harry’s Mall. Thomas de Burgo established this first monastery. The monastery became known as Saint Francis Abbey, the name it retained during the Suppression. The Abbey River, Abbey area and Abbey Fishermen derives their name from the Abbey located in the area. The friars were expelled from the city for a short time in 1651, during which time it is said that the Abbey Fishermen fed them. After this they successfully regained occupation of their residence at the junction of Athlunkard Street and Nicholas Street. A site in Newgate Lane was acquired in 1782, on which a chapel and friary was built.